Forget the heated water buckets! This works!! I am so tickled, I just have to share. I have three stalls in my little barn, running water and electricity ... but not hot water and only minimal electricity. Plus, King just turned 29 -- and he never did grow a heavy winter coat. Let's just say he does not "do" winter very well! Consequently, the boys get pulled in overnight when it's bitterly cold. And this winter has been a real bear! So, this has meant that we haul hot water out at 10 p.m. to refill water buckets, and then literally run out first thing in the morning to pull their water buckets, which have turned into solid ice by morning. We take each water bucket out to the heated trough outside, set it in the trough to defrost, dump the ice cube as soon as it loosens, then refill the bucket with fresh water. When we turn the horses out, we dump the left-over fresh water into the water trough outside and leave the buckets empty inside all day so they won't freeze up. Well ... I have DREAMED of getting an electrician out here to safely install heated water buckets for each stall ... but money is tight, and I am afraid of the fire hazard, too. Then I found these http://www.wildangelcozy.com/ -- a water bucket cozy! Like a beer cozy, only for flat-back water buckets! At around $30 each, I ordered three and hoped for the best. OMG!!! These things are fabulous! Temps last night were hovering around zero-degrees (F), havent' climbed over freezing for at least 48 hours ... horses still have nice, liquid water in their buckets -- not even any ice floaties! And, the really great thing is that King drank his bucket almost empty last night! He is so picky, if the water gets too cold, he will not touch it! We filled his bucket with warm water last night at around 8 p.m., by this morning at 9 a.m., he still had liquid, drinkable water in his bucket! I am so happy to have found something that actually WORKS as advertised, saves me a ton of time and labor, and gets my old guy to DRINK! Yay! I tolerate all kinds of animal idiosyncrasies. I am so going to have to order this!! Thanks for posting!!! How do you think they would hold up to a hay dipper? I mean, is the top removeable completely so it could be laundered occassionally? I have two who would respect it and one who would likely trash it. SmartAlex -- yes the top is completely removable, in fact, it's all completely removable and can be brought in and laundered. The top is actually optional, you don't HAVE to use it if your weather is not as bitter. I wondered if everybody would figure out how to drink through the hole, but they had no problems whatsoever. Or you could do what I did, aptly named The Bucket 'o Goo (patent pending). I bought a $4.99 bucket from TSC that was slightly bigger than my water bucket, filled it 60% with spray foam insulation, then set my water bucket inside it which caused the spray foam to fill in most of the gaps up to the top. I let that cure then made a wooden top to cover the edge of both buckets, screwed it on, sanded the edges smooth for Her Higness, and voila! Insulated bucket. Works great up here in the far north, isn't heavy and I can still clean it out. My next project, to create a lid that goes halfway across with some sort of water-proof, thermal fabric to hold even more heat in. The only problem is that if you do fill it part way with hot water, it steams for so long, she won't go near it 'cause she thinks her water bucket is on fire! Editted to add it cost me about $25.00 but I already had the water bucket. Your beliefs don't make you a better person, your behaviour does. OK, we'll try it. The Grey Horse loves to do product testing...Now if I can only figure out where he hid my handy dandy blocker ring. My BO up in CT created something along those lines, but without a cover, he took milk crates, put the bucket in the crate, lined with insulation and duct tape over any exposed insulation, and hung the milk crate on the wall. Worked pretty well. They do have a hefty price tag on them, so kudos to those of you that have come up with a more economical solution to the problem. Two good ideas in one post! I like it! I am always envious of those of you who are handy and can figure out how to do these things yourself! But for those of us who are handiness-challenged (or time-challenged!) I think the cozy is a great (inexpensive) solution! I also like that I can take these cozies off in the spring, wash 'em with the horse blankets and store them all, along with the trough heater, until next winter! I read someone on CoTH who insulated her buckets herself with foam and duct tape. That's what gave me the idea to search online for insulated water buckets ... and that's how I found the cozies! I've been using the Wild Cozies for about a month now. We've had weather that was "warm" and above 25 degrees so I haven't needed them but NOW I do. Highs of ten and lows in the singles are just perfect for the cozy. They are great! I haven't attached the top yet as my horses and goats are still in the learning stage. My mule wouldn't drink out of a bucket with a cozy on . She was sure there was something wrong with it. The others are not bothered by the cozy. So far the goats and my wee mini boy haven't played with the cozies either, which is a bonus. KR - that is brilliant! Am I understanding correctly that this foam stuff is pliable enough that you can squirt a pile of it in the bigger bucket, then push the water bucket into the foam to make the "nest", and the foam shifts and oozes up the space between the sides of the buckets? I've been dabbling with a similar idea (but I understand it has to be done under somewhat warm temps so didn't get to it this year) but assumed that I'd have to have the two layers positioned and then spray the foam to fill the space between. I want to start my project as soon as spring hits so it's DONE and I don't have to think about it when winter rolls around. Interesting, but for less than $200 at Home Depot you can buy an "under the sink" tankless, 110v water heater. It just plugs into a regular 110v outlet. They work well enough (we have one in our trailer). Figure another $25 for installation parts and you never have to carry a bucket of hot water again. 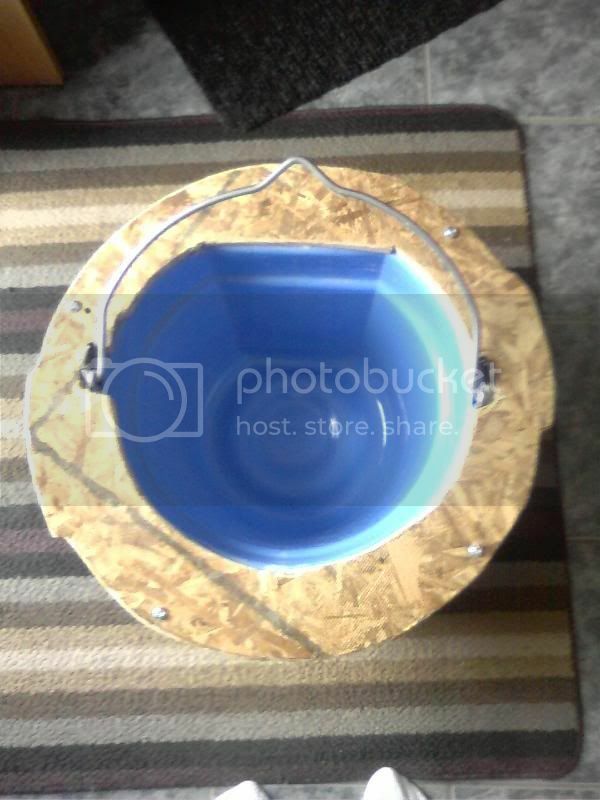 Others looking for a low cost solution might want to check this out before buying "bucket coozies." KR needed a solution to frozen buckets and does not have power in her barn. So, I just shelled out $100 for three bucket cozys. He's sort of like Tim the Toolman. Actually, his name is Tim Remember the episode when he decided to add a second sink to the bathroom and ended up destroying the house? A tankless water heater wouldn't help me in this situation -- not that I wouldn't LOVE to have hot water in the barn! Well, actually I already have hot water in the barn ... I carry it out there every night in a big bucket! My issue is not having hot water. My issue is having the water in the bucket not freeze overnight while the horses are in the stalls. Hot water in the barn would not solve my problem unless it ran continuously into each of my three horses' water buckets! Sort of like a fountain ... now this sounds like a lovely idea, but not entirely practical! My water source in the barn is a frost-free hydrant. I love my frost-free hydrant, (dear frost free hydrant, if you're listening, please please do not think that I am in any way criticizing you!) however -- having a frost-free hydrant is a long ways from having running water to a tank-less water heater! I mean, it's a long ways money-wise! Especially in a land where water is freezing in the buckets ... let alone the pipes! That is sooo cool! 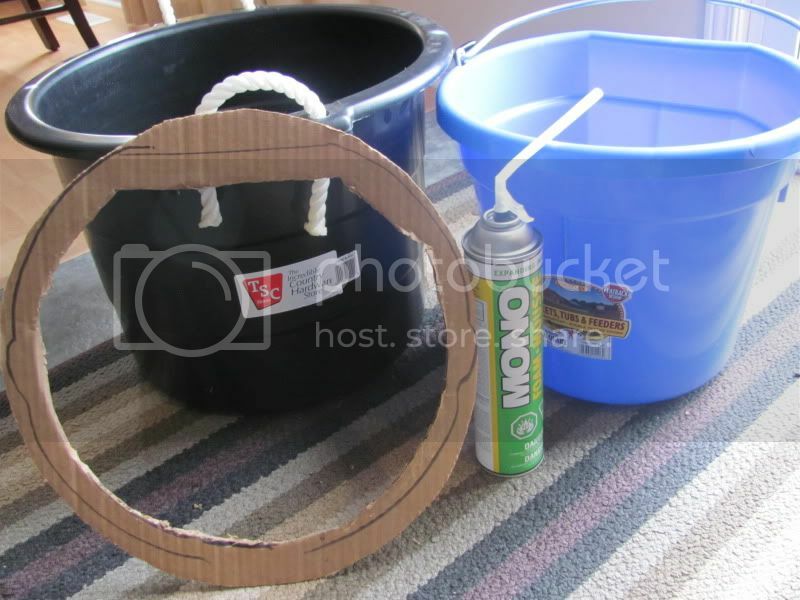 I am so inept, though, I know there is no way I could have ever cut that big circle-thing out of wood. Oh, sometimes I sit around here watching HGTV and think I can do those things ... I even own a power-nailer because they look so easy to use on TV! However, when I actually try to fix or build something around here, my writer husband and I usually consider ourselves very lucky to escape with all of our appendages!